Fancy a Windows 10 PC you can put in your pocket? Then you need to check out the MagicStick, another dongle-style computer that plugs into an HDMI port. 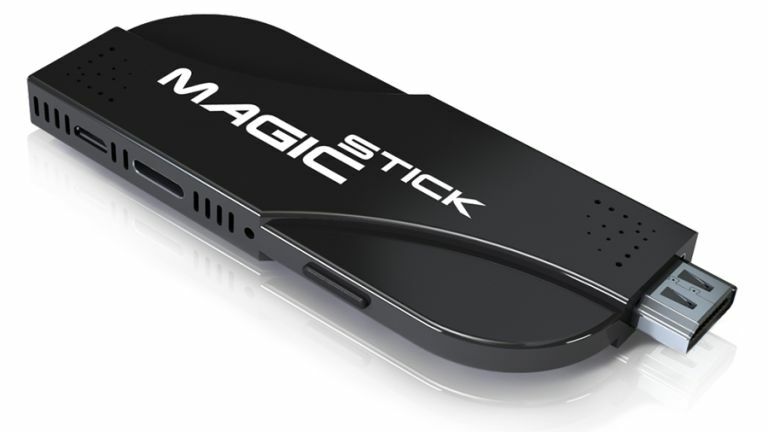 The MagicStick is a crowd-funded effort on Indiegogo, and one which has done very well indeed, more than quadrupling its funding goal and netting $232,000 (around £150,000) thus far. This device is a relatively powerful little stick, and the MagicStick Wave (there's also a lesser model, the MagicStick One) model boasts an Intel Cherry Trail Z8700 processor with a 16-core GPU, backed with 8GB of RAM and 64GB of storage. You simply plug it into the HDMI port on your TV or monitor, and hook up a keyboard and mouse, or indeed you can control the device via a mobile app on your smartphone or tablet. The Wave is currently up for pre-order at $249 (around £160) plus shipping, and it comes with Android plus a copy of Windows 10 Home on board, albeit on a three-month trial with the latter. For a fully activated Windows 10, you'll need to fork out an extra $49 (around £30) – either that or you can plump to have Linux installed for free instead. As well as HDMI 2.0, you also get a USB 3.1 Type-C port on board for fast data transfer speeds, a microSD slot for expanding the storage capacity, and 802.11ac Wi-Fi. The stick boots up in less than seven seconds and only uses 5W of power. There's also an option to double the storage up to 128GB for an extra $79 (around £50). Alternatively, if you want a cheaper variant of this pocket-sized PC, the aforementioned MagicStick One is selling for $99 currently. That's a lesser effort powered by a Cherry Trail Z8300 CPU with 2GB of RAM and 32GB storage. All this hardware is scheduled to ship in December, with shipping to the UK costing $29 (around £20).